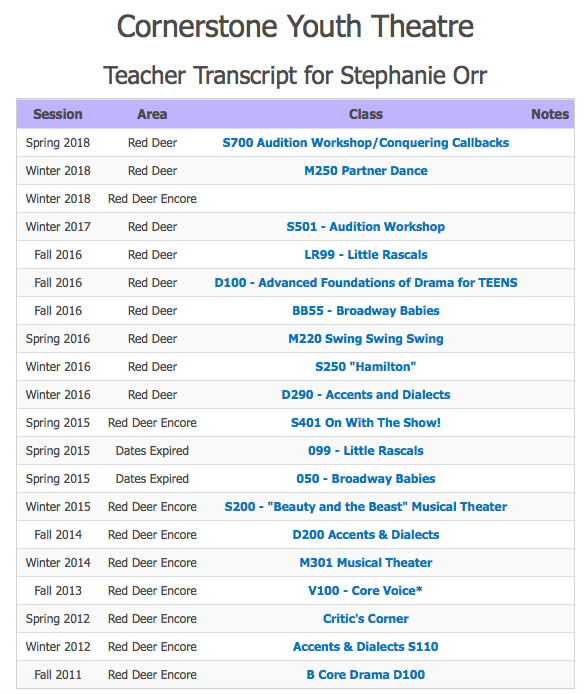 Stephanie Orr has worked in many capacities with Cornerstone Youth Theatre affiliates since 1998 in Spokane, Washington. A co-founder and business manager of Christian Youth Theatre - North Idaho in 2007, she taught classes and directed two fully staged productions (Jungle Book and The Adventures of Tom Sawyer) before joining the staff of Cornerstone in Central Alberta in 2011. She has taught a variety of classes for Cornerstone...Drama, Voice, Musical Theater, Accents & Dialects, and other specialty classes, as well as directing many main stage musical productions (Jungle Book, Annie, Robin Hood, Narnia, Grimm, Wild West, Tom Sawyer, Honk!, Joseph and the Amazing Technicolor Dreamcoat, and most recently The Wizard of Oz) She is excited to be a part of a theater arts training organization in her home area of Central Alberta.